Page revised in December 2015. Photos taken with Canon Powershot SX 700 HS. 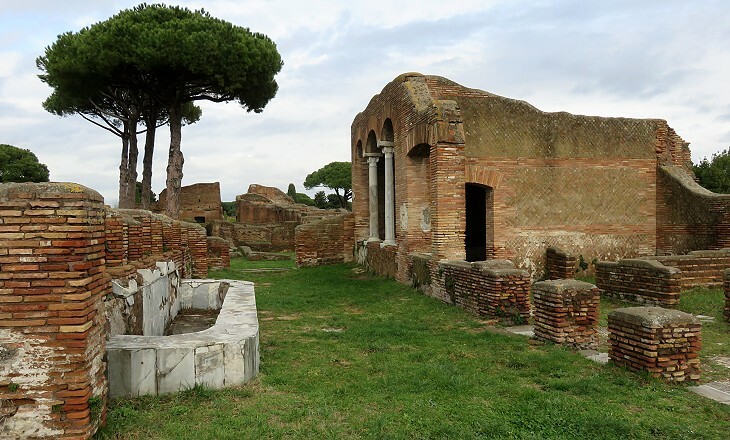 By and large systematic archaeological diggings at Ostia began at Porta Romana and progressed on an east-west direction. 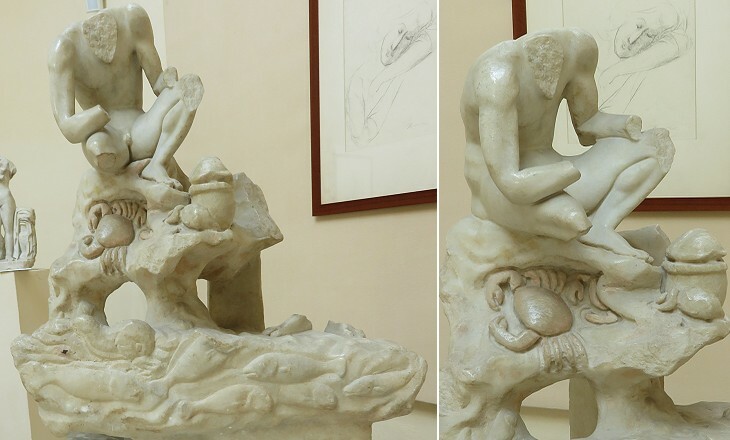 A large area south-west of Cardo degli Aurighi was not excavated until the late 1930s. Apparently it did not contain any major buildings, but the work of the archaeologists was rewarded by the discovery of a well planned residential complex. It appears that a fire had affected the area in 115 AD thus paving the way for a new major development which occurred in 123-125 during the reign of Emperor Hadrian. 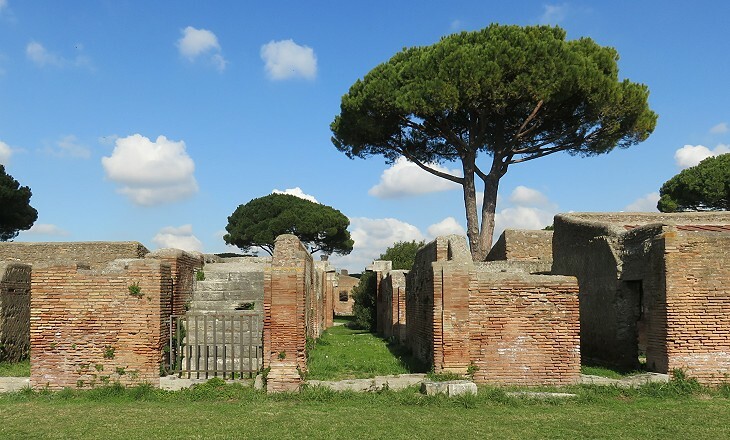 In those years, because of the opening of Portus, an artificial harbour two miles north of Ostia, the town lost some manufacturing/trading activities and it acquired a more residential aspect. The new development had an overall rectangular layout, similar to that of a Roman town, with a long east-west street and a relatively short north-south street. The resulting four large blocks were surrounded by a garden. The residential district was completed by a series of other buildings (apartment blocks or individual houses) which bordered on all four sides of the garden. One may wonder whether this residential neighbourhood had security guards at its entrance because it could be accessed only through a portal on Decumanus Maximus and two passageways on Cardo degli Aurighi, one of which was right opposite Caseggiato degli Aurighi. The complex had a number of shops, but it did not have taverns or baths or temples. It appears that some buildings had a private supply of water, but the majority of the residents availed themselves of six fountains which were placed in the garden at appropriate intervals. According to some archaeologists in origin the blocks had four storeys, but after an earthquake damaged most buildings in the late IIIrd century, they were reconstructed with just one storey. In 1969 excavations in the area west of the garden led to finding a house which had not been rebuilt after the earthquake. Its collapse did not impact on the frescoes of some ground floor walls. It had instead the effect of preserving them. Some small images of women were interpreted as indication that the building was the residence of priestesses and the house was named after them (Ierodule means "in charge of a temple"). The choice of the name however hinted at a particular type of priestesses, i.e. those who practiced sacred prostitution at a Temple to Venus at Corinth. Today the reference to Ierodule is regarded as not being supported by enough evidence. 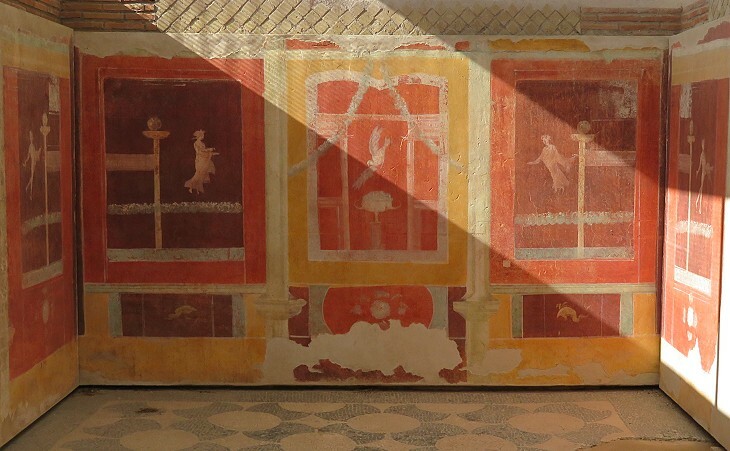 The hope of having found an establishment similar to a famous brothel of Pompeii, which could have attracted crowds of visitors, has vanished. The house is now officially named after Lucceia Primitiva, a woman mentioned in an inscription found in the building, but it continues to be known as the House of the Priestesses. The paintings are dated 130-140 AD so they were made when the house was built. 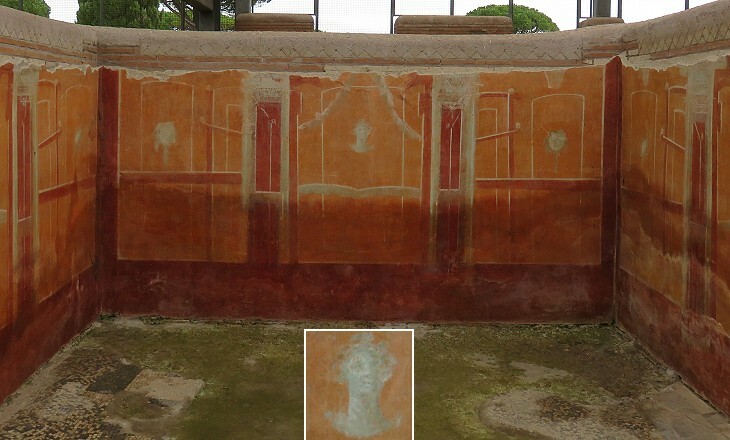 Owing to the fact that they are well preserved they provide an idea of the decoration of the whole residential neighbourhood, because traces of red and yellow frescoes have been found in most of the buildings. 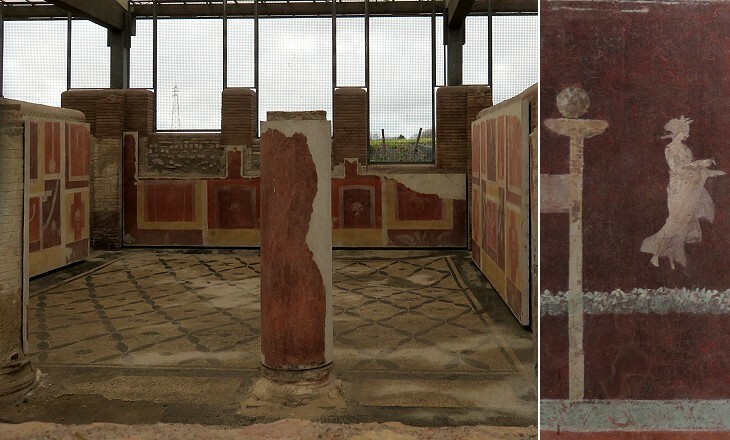 The colours used at Ostia are similar to those found at Pompeii. The buildings on the eastern border of the garden had a decoration similar to Insula delle Ierodule and they retain some fine black and white mosaics. The construction and decoration of the whole neighbourhood in a rather short period of time (123-140) must have required a major coordination effort. 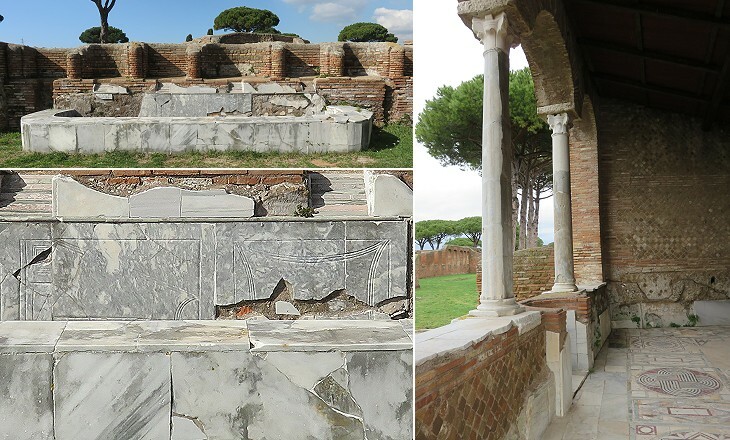 Perhaps it was planned and financed by a sort of building society among the richest citizens of Ostia with maybe the involvement of some Roman senators. 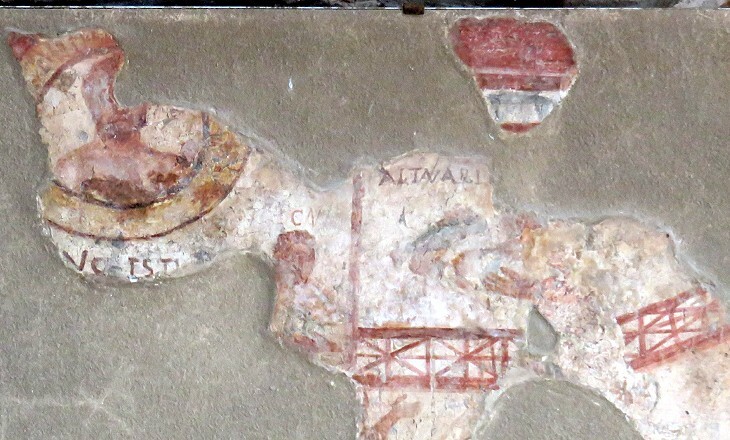 In general the decoration of floors and walls was based on traditional patterns, so archaeologists have paid particular attention to instances of frescoes or mosaics which departed from them and could provide some pieces of information on the life of the residents. The fresco shown above perhaps portrayed a dead man in a clipeus (a round shield and eventually a decorative frame for portraits and busts). His heirs were depicted while performing some funerary rites in a building of which we see a balcony. 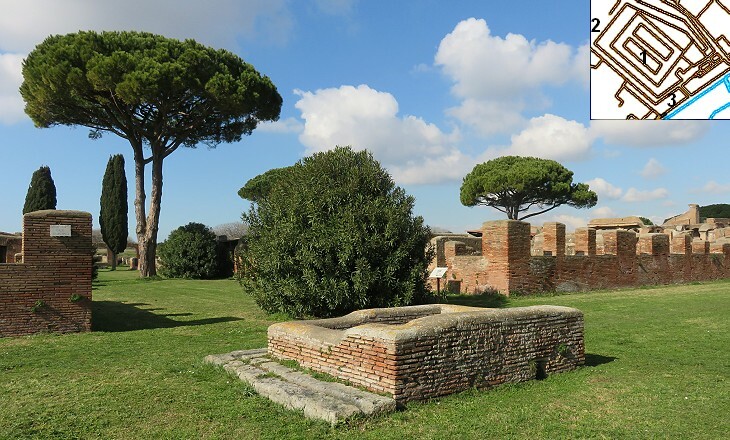 The subject is rather unusual because in a Roman house the dead were honoured in a lararium, a niche or an altar having the shape of a small temple, which was situated in the courtyard of the house. 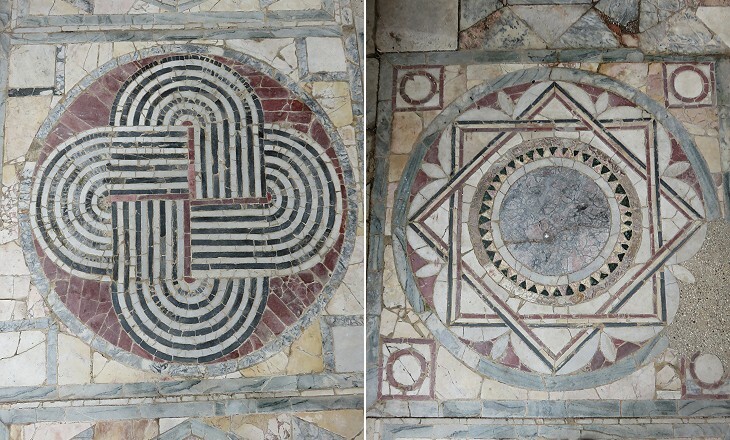 Domus dei Dioscuri: details of the floor mosaics: (left) the Dioscuri; (right) a Solomon's knot and a decoration motif based on "peltae"
This house was situated at the south-eastern corner of the garden and it shows signs of having been modified in the early Vth century. 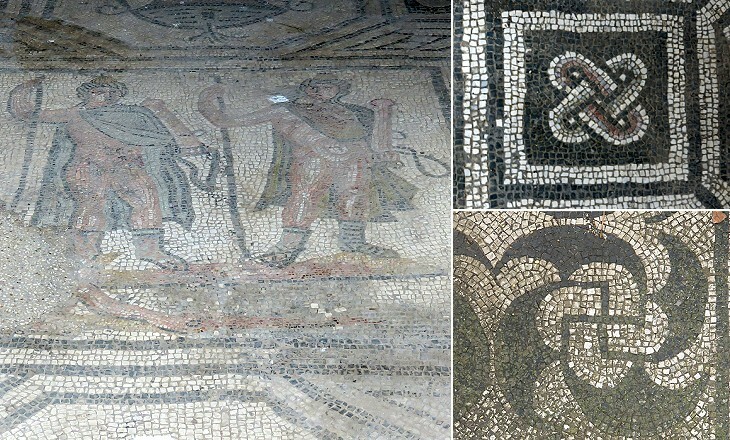 It has some interesting mosaics including one which shows the Dioscuri. They were portrayed holding bridles (they were horse tamers) and a big sceptre in their left hand. The latter is rarely seen. Its presence could be explained by the fact that Dioscuri holding sceptres were depicted on coins minted at Ostia during the short reign of Maxentius. 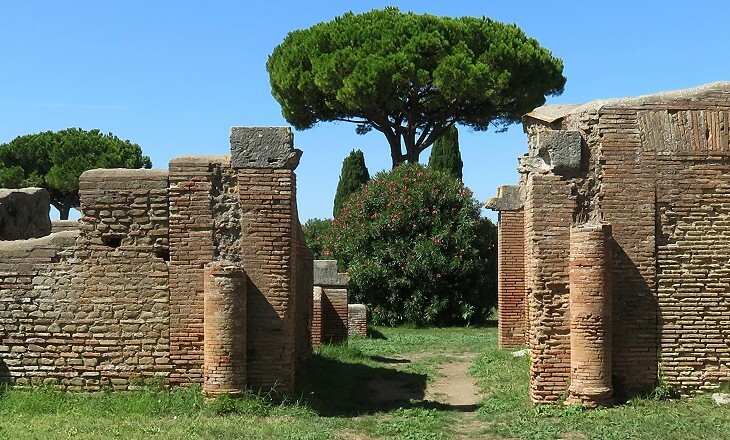 This house was installed in the IVth century in the backrooms/apartments of shops having their entrances on Decumanus Maximus and it stood opposite Casa dei Dioscuri. Today one feels as if the nymphaeum and the room with the arches were on the opposite sides of a street, but what seems a street was a long and narrow courtyard. The house had an overall rather poor layout, although much money was spent on its decoration. The basin of the nymphaeum was decorated with marble taken from other buildings and its length does not match that of the niches on the wall. The room with the arches was perhaps a summer dining room because it faced northwards. The opus sectile (marble inlay) decoration of its floor is very fine and it is typical of the Late Empire when many broken marbles were available. The building is near Porta Marina, the ancient sea gate, so it is not very far from Domus dell'Opus Sectile, which houses a striking opus sectile decoration. 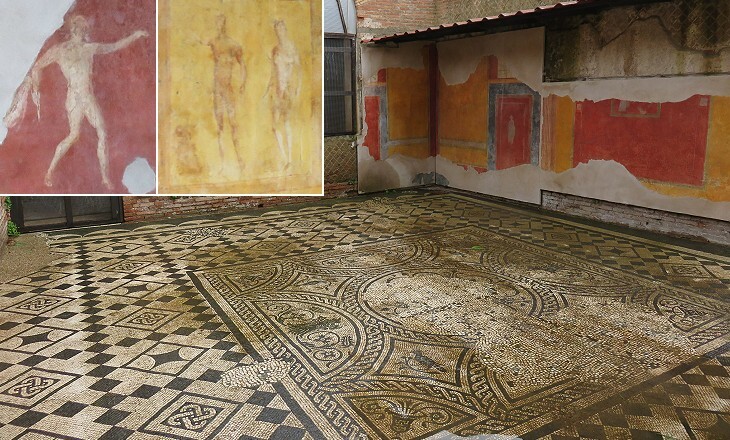 The image used as background for this page shows another opus sectile detail of the floor.